by creating more internal balance. Trina explained to Anna that we all have a variety of aspects and parts of ourselves that show up in different situations. For example, our professional “Work Self” is probably quite different than the self that plays with our pets. We might be serious and no-nonsense at work and be playful and silly with our pets. Each of us has various selves that come together to help us manage particular aspects of our lives. 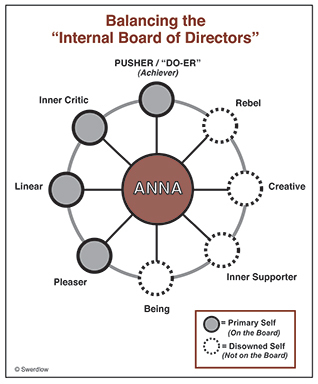 This diagram illustrates the various opposite “selves” that made up Anna’s internal “Board of Directors” when she began working with Trina. As you can see inside the box on the lower right: the “Primary Selves” are the parts that are strong (on the Board of Directors), whereas the “Disowned Selves” aren’t available to offer balance (aren’t on the Board of Directors). IF he or she is not continually driving pedal to the metal toward BURNOUT. 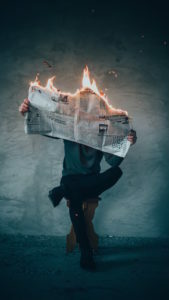 In fact, many business professionals (and stay-at-home parents) have FABULOUS Pusher/ “Do-ers,” but without the polar opposite, the “Being Self” they risk burning themselves out. By contrast, the “Being Self” knows when to pull back, relax, meditate, recharge and can offer valuable intuitive advice for the person’s business as well as personal life. She worked with Trina using Voice Dialogue and began to understand that her well-meaning Pusher/ “Do-er” was driving her toward exhaustion. 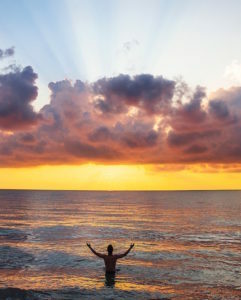 By accessing and integrating her disowned “Being Self” through regular meditation and other relaxing, recharging activities, Anna’s anxiety quieted down. 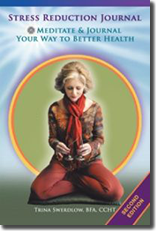 In addition, her digestion improved and she was finally able to turn off her busy mind at night. Restorative sleep uplifted Anna’s moods and increased her ability to appreciate and ENJOY her life. Voice Dialogue is a valuable tool to help people understand and utilize their various selves to increase internal balance and integration. * The Voice Dialogue Method was created by psychologists/authors Hal and Sidra Stone. Many wellness professionals across the globe use this method in their practices. Trina studied the Voice Dialogue Method with one of Hal and Sidra’s top trainers and Trina is listed on their international website as a facilitator. (Name of client has been changed to protect privacy).